I am about to reveal some of the research showing lemon to be one of nature’s most powerful substances. But don’t think for a second there’s anything “magical” about it. It’s just good common sense, a concentrated source of phytonutrients and fiber, along with two extraordinary ingredients that have made lemon the healing superfood it is. In fact, you probably remember your own grandmother using lemon almost daily. Whether it topped your favorite entrée…helped you break a stubborn cough and sore throat…or was used to cleaned up around the home, the versatility of the lemon proves it’s the real deal. And now, after reviewing the vast number of scientific studies on the healing benefits of lemons, I can see why it’s so valued by both traditional healers and modern physicians alike. And that’s just the tip of the iceberg! There are literally dozens of ways lemons can change, protect, and fix your health! Foods From Nature Really CAN Heal Your Body! With the numerous benefits of lemon, you’d think we’d all be using it at home every day. Or that the lemon would be the treatment of choice among physicians everywhere. Instead, the food and drug industries work 24/7—while spending millions of dollars on advertising—trying to convince us their unnatural, highly-processed, chemically-ladened and toxic grocery store foods and synthetic pharmaceutical formulations created in a laboratory are good for us. And when you consider the powerful ability of natural foods like the lemon to heal the body from all sorts of disease, you can’t help but wonder when we’ll wake up. We discovered there’s much more to the lemon than just treating a vitamin C deficiency, or balancing your body’s pH. We found so many ways that people use lemon to naturally nourish, heal, and cleanse both their body and home that the list is just too long to include here. Our exclusive guide on the health benefits of nature’s most versatile fruit is packed full of everything you need to know about using lemons to protect your health. Plus, dozens of best practices and unique recommendations for beautifying your skin, hair, and nails…cleaning up and restoring items around the home…even protecting the health of your pets. Make no mistake. This is everything…and I mean everything…you need to know about the lemon. 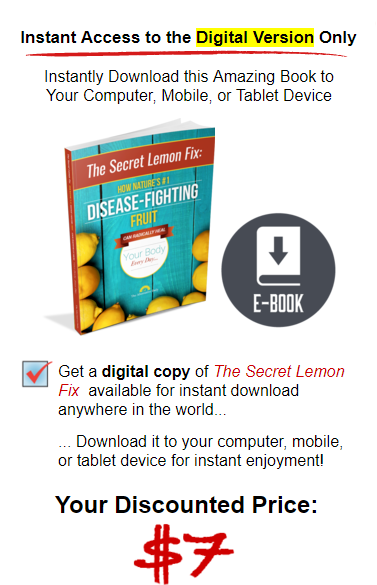 Then you’ll want to grab a copy of The Secret Lemon Fix: How Nature’s #1 Disease-Fighting Fruit Can Radically Heal Your Body Every Day. Because we’ll show you the rich history…the vast number of health-promoting nutrients…the convincing research…and the long list of raving fans who discovered the secret of lemon to fix your health and clean your home. Why the demand for lemons was so incredibly high that lemon producers charged a dollar for a single lemon…in 1849! The reason behind the American Diabetes Association decision to include lemons on their list of superfoods. And while you’ll learn about dozens of best practices and newly-revealed tips for using lemons at home, what will most impress is the sheer amount of research backing up the incredible benefits of lemons to heal your body. Lemons are known to break down calcifications, including kidney stones. If you get these stones, you know how painful they can be. Carbohydrates make up nearly ten percent of the lemon. Much of that is soluble fiber and simple sugars. The Choice is Always Simple…Choose Nature! I don’t know about you, but if the choice is between consuming Big Pharma’s latest laboratory concoction, or using a simple natural substance like lemon—it’s no contest. Plus, lemons act as a strong antiseptic, with a kill-rate for lemon oil of 99.96% against airborne bacterial pathogens…including meningococcus, typhoid bacilli, Staphylococcus aureus, Pneumococcus, diphtheria, and tuberculosis. In fact, scientists say there is no known virus or bacteria that can live in the presence of lemon oil for any length of time. And according to Jean Valnet, MD, vaporized or diffused lemon can kill meningococcus bacteria in 15 minutes…typhoid bacilli in one hour…Staphylococcus aureus in two hours…and Pneumococcus bacteria within three hours. Even a 0.2% solution of pure lemon oil can kill diphtheria bacteria in 20 minutes and completely inactivate tuberculosis! Now that’s fast, powerful healing! And we’re just getting started! I could tell you about so many incredible uses for lemon to heal the body that you’ll want to run to your nearest grocer and pick up a bag or two right away! And you’d be better off for it! Because lemons are a powerful…versatile…safe way to restore your health, and that of your family. As well as clean up around the kitchen, bathroom, pantry—even the yard! In fact, after using just one or two of the dozens of recommendations you find in The Secret Lemon Fix, you’ll know what I mean. Now you can. Because today, we’ve reserved for you your very own copy of The Secret Lemon Fix: How Nature’s #1 Disease-Fighting Fruit Can Radically Heal Your Body Every Day. Look, we know in order for most people to make any meaningful health changes in their lives, the steps need to be easy to access…easy to understand…and easy to implement. That’s why in The Secret Lemon Fix, you’ll discover some very simple, very effective ways to make nature’s most powerful fruit a simple part of your daily routine. Make lemon a part of your daily diet—so you feel better…look better…and function better. Use lemon to clean and freshen up your home—so it looks and feels just like it did the day you first moved in. Give lemon to your favorite pet—so you can be sure they’ll be with you for years to come. Because lemon is such a powerful natural treatment for preventing—even healing—some of the toughest health conditions, leading-edge physicians around the globe are recommending patients add lemon to their daily diet. And the reason is simple…because it works! Indeed…the results they get for both themselves and their patients explain why throughout history, lemon has succeeded in conquering hundreds of important health crises. With everything we packed into The Secret Lemon Fix: How Nature’s #1 Disease-Fighting Fruit Can Radically Heal Your Body Every Day, we could easily charge $29.95. And frankly, the healing you could experience from using just one or two of the dozens of recommendations inside would make it more than worth that. We wanted to make it super easy for just about anyone to get their hands on this information. It’s the reason we're offering it in both physical form and in an easy-to-download e-Book. That way, you can benefit immediately from its extensive research and timely advice. Plus today, you can get The Secret Lemon Fix immediately…for the low introductory price of just $7.00! That’s right. We’re not just making our newest health resource easy for you to access…we’re making it easy for you to afford. That way, it won’t cost you a small fortune to discover why so many people are turning to the lemon to boost health—even rid disease—in their own bodies, and that of their loved ones. Of course, with all the powerful tips you get in The Secret Lemon Fix, this price is a steal…and you’ll want to grab your own copy soon. Because I can’t guarantee how long we can keep it this low. We Thought You Should Try it Today…RISK-FREE! We have personally experienced the health benefits of using lemon every day. Many of our own staff start their day with a glass of warm lemon water. Plus, we use lemon for cooking meals, cleaning up around the home, and even protecting the health of our pets. So we know first-hand how this information can change your life and that of your family. But you need to grab your own copy, read it cover-to-cover, and use the valuable information inside. Here’s to clean, healthy living…naturally! P.S. The information, research, and recommendations we provide in The Secret Lemon Fix aren’t meant to help you and your family just solve just minor health issues—like sore throats, fevers, and canker sores. We want to help you solve more serious challenges—like lowering LDL cholesterol, eliminating chronic insomnia, and fighting dangerous free radicals—so you can live healthier and longer…without always needing to see your doctor or visit your local pharmacy. Plus, we’ll reveal natural beauty tips…simple ways to protect the health of your pet…and safe, effective ways to clean up around the home—most of which you probably have never seen before. P.P.S. Think about it…we created The Secret Lemon Fix: How Nature’s #1 Disease-Fighting Fruit Can Radically Heal Your Body Every Day with one thought in mind. That is, restoring true health shouldn’t have to take a lot of work…a lot of time…a lot of money…or a lot of unnecessary prescription medications. So go ahead…tap into the special healing powers of the lemon…nature’s #1 disease-fighting fruit. And don’t forget, you're covered by our exclusive 60-day, 100% no questions asked, money-back guarantee. If for any reason you don’t feel our newest resource is the most helpful information available on the health benefits of the lemon, we'll rush you a full refund. And you can keep your e-book as our way of saying thanks for trusting us with your health. And I sometimes wonder, are we kidding ourselves? I mean, really…what’s this world coming to? It’s almost like…we’re letting them poison us on purpose! 11 super simple ways lemons can help protect your health around the home (if you have kids, one of these is a totally safe way to repel insects!). One unique way researchers say lemons help prevent overeating…especially when we’ve already met our nutrient requirements. One trick to ensure you get all the benefits of fresh lemons, but in a concentrated formula. Not only that, this keeps your lemons from spoiling! 8 incredible ways for using lemons to protect the health of your dog. Plus, specific tips on how to administer it …suggested doses…and what to watch out for. One limonoid called limonin even stays in your body for up to 24 hours. In comparison, other natural anti-carcinogens like the phenols in green tea and chocolate only stay in the body for just a few hours. Which may explain why citrus limonoids are so strongly anti-cancer. Another component concentrated in the peel and pulp of lemons is pectin, a naturally occurring soluble fiber made of healthy sugars and acids. Clinical research shows an extract of pectin—modified citrus pectin—helps minimize the progression of advanced prostate cancer in men 5. But it’s also useful in the prevention and treatment of melanoma, colon, prostate, and breast cancer. Once again proving cancer cells cannot survive in nature. For example, a study by German researchers at the University of Kiel found eating fiber from citrus fruits like lemons reduced study participants’ total blood cholesterol levels by 6.5%...after just four weeks! Therefore, adding a couple teaspoons of lemon juice to any meal could help you lower your body’s insulin response. If you want to eliminate kidney stones once and for all…try regularly consuming the juice of freshly-squeezed lemons! Plus, other compounds in lemon are found to be very effective at helping with digestion because they stimulate your liver to produce enzymes and assist your stomach and gallbladder in using those enzymes. This is great news if you suffer from stomach issues related to poor digestion. Truth is, lemon is one of the most powerful natural healing substances we’ve ever studied. And tons of research—since the first controlled clinical trial by Dr. James Lind—highlight the incredible protective effects of lemon in the human body. And we put every last bit of this research—and much more—into The Secret Lemon Fix: How Nature’s #1 Disease-Fighting Fruit Can Radically Heal Your Body Every Day. From how to relieve anxiety and chronic fatigue…boost heart and kidney health…or dissolve corns and calluses on the feet—lemons truly have you covered from head-to-toe. 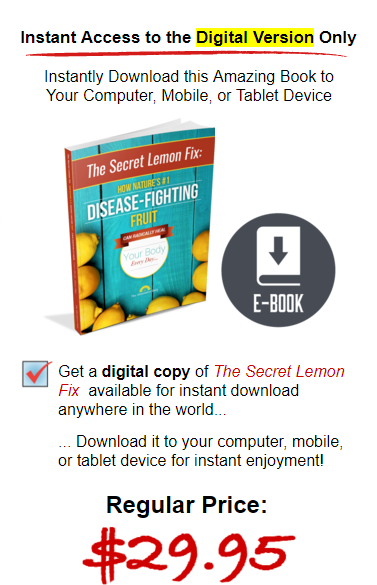 That’s why when you get your own copy of The Secret Lemon Fix: How Nature’s #1 Disease-Fighting Fruit Can Radically Heal Your Body Every Day, you’re covered by our exclusive 100%, No Questions Asked, Money-Back Guarantee…for a full 60 days! Take two full months to discover why the lemon is the most sought-after natural treatment for detoxing your body…strengthening your heart health…protecting against free radical damage…dissolving kidney stones…managing weight…and more! Plus, how it’s so crazy simple to use in your diet and daily routine for better health and a cleaner home. In fact, if you don’t believe this is the most comprehensive information on the benefits of using lemon for health, OR if you don’t experience significant benefits from using this information, just let us know. We’ll be happy to refund 100% of your money. No questions asked. Plus, you can keep your book with our compliments! We’re that confident the information we put in The Secret Lemon Fix will significantly change your life for the better. But without any risk to you.